Left-wing Jewish newspaper calls ZOA a 'bigger threat' to Jews than Linda Sarsour, BDS. The Coalition for Jewish Values (CJV), a national organization representing hundreds of Orthodox Rabbis, today denounced The Forward newspaper as "an embarrassment to Jewish journalism" after it published a vitriolic piece by Steven Davidson claiming Morton Klein, Director of the Zionist Organization of America (ZOA) had views that were a "bigger threat" to Israel and Jews than Linda Sarsour and the anti-Israel BDS (Boycott, Divestment and Sanctions) movement. "The public defamation of Morton Klein is a repugnant violation of Jewish law and evinces a gross disregard for Jewish values," said Rabbi Steven Pruzansky, a Senior Rabbinic Fellow at the CJV. "The Forward has a skewed agenda in which support for Israel and the Jewish people, to which Mort Klein has dedicated his life, is somehow a vice, while indulging our mortal enemies is somehow a virtue." Rabbi Pesach Lerner, besides being a CJV Senior Rabbinic Fellow, is also the Executive Vice President Emeritus of the National Council of Young Israel and Co-Chairman of the American Friends of the International Young Israel Movement, Israel region. He writes that "I have known and worked with Mort Klein for over 25 years. He is one of the most hard working pro-Israel professionals I know. I am proud to call him a friend and a colleague." "The Forward's Israel reporting displays a bias comparable to that of Al-Jazeera, and its coverage of Judaism is even worse," said Rabbi Yaakov Menken, Director of the CJV. "What is Jewish about slandering pro-Israel conservatives while minimizing the anti-Semitic views of Linda Sarsour? 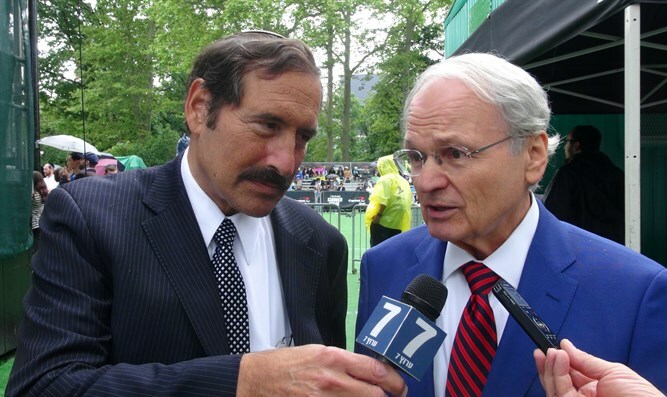 It is an embarrassment to Jewish journalism." According to writer Liel Leibovitz, the Forward has published at least 40 articles attempting to tie Dr. Sebastian Gorka to the Nazis due to his membership in a Hungarian organization founded in the 1920s that, like the rest of Hungary, fell to Nazi control. Gorka's father risked his safety to protect Jews and was imprisoned by both the Nazis and the Communists, but this was of no interest to the Forward in its haste to pursue a narrative of demonization. "The Forward is forcing us to choose sides," said Rabbi Menken. "Either Morton Klein and Dr. Gorka, or The Forward, are pro-Israel and [pro-]Jews. And the facts demand that we side with Klein and Gorka." The Jewish Daily Forward was founded in 1897 as a newspaper by Yiddish-speaking socialists. It is now a monthly, appearing in both English and Yiddish in print and on the web, with a clear left of center editorial stance. The Rabbis said that with the High Holy Days approaching, soul-searching at The Forward is overdue. "We are taught that G-d is always ready to accept sincere repentance when accompanied by true abandonment of past misdeeds," said Rabbi Lerner. "It is not too late for The Forward to turn over a new leaf, and demand accuracy and a modicum of fairness from those who contribute." The Coalition for Jewish Values (CJV), directed by prominent rabbinic leaders and representing hundreds of rabbis across North America, articulates an authentic Jewish perspective on current events, and promotes Jewish values through writing and teaching derived from traditional Jewish thought.